One Saturday each August, many local churches, schools, and businesses in Orange County come together to donate school supplies, immunizations, haircuts and other services needed to support children in Orange County as they return to school each August. Watch for information during the summer months. Church members prepare and serve meals to those who have experienced a recent death in their family. Meals are provided at the church before or following the funeral or they can be delivered to the family’s home. 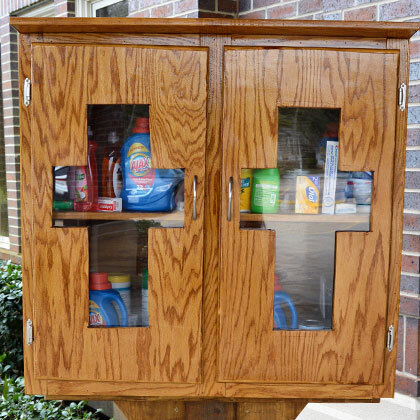 The beautiful wooden cabinet with inlay cross doors set by the Family Life Center portico drive through houses our community Blessing Box! People in the church and community can "take what they need, leave what they can, but above all, be blessed." The box is filled with laundry detergent, dish soap, bar soap, toothbrushes, personal hygiene items, can goods, school supplies, or whatever God places upon one’s heart to include. Prayer cards are included so community members' needs can be prayed for if they wish to share. People can take whatever they need from the box or add items at any time of day or night. Need something? Take it. Want to leave something? Leave it. Most importantly, leave it in God's hands for those in need. Please be in prayer for our community and those utilizing our Blessing Box. 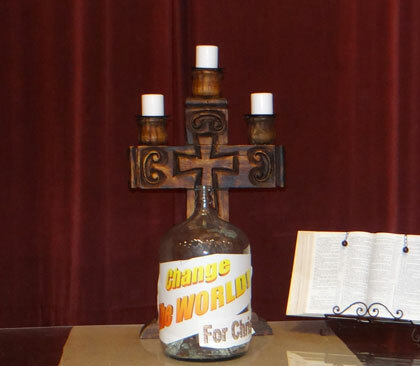 Change collected during each Sunday service supports local mission projects created by First United Methodist Church to serve our community. Each week of the fall and spring semesters, a team of FUMC members go to the Lamar-Orange campus to create relationships with students and hand out useful items such as food and school supplies. To be a part of this ministry, donate items such as pens, pencils, notepads and highlighters or meet at the Family Life Center on Tuesday mornings at 10:25 to go visit with the students. First United Methodist Church Orange donates funds, food and other items such as toiletries needed by families in Orange County to the Orange Christian Services. Place items in labeled containers in the foyer of the Family Life Center or place monetary donations in the baskets provided during communion on the first Sunday of each month. If you like to crochet, then this is for you! Members crochet shawls while praying over them. These shawls are delivered to those who are in the hospital or homebound due to illness. A special prayer is said over each item while being made and before being delivered to the person in need. To help children who have been removed from their homes, First United Methodist Church Orange donates diapers, wipes, and new clothing. Place items in the labeled containers in the foyer of the Family Life Center. Located inside the Port of Beaumont, the Seafarers’ Center of Beaumont is an ecumenical ministry serving all foreign and domestic seafarers. Here, seafarers can rest, relax, worship and enjoy a few hours on land before returning to sea. Transportation from the ship to the Center as well as to a variety of destinations is also provided. Donations of toiletries, magazines, and money can be placed in the labeled containers in the Family Life Center. High school youth go to a UM ARMY camp each summer to provide hands-on work to improve homes for homeowners in need. We also host UM ARMY camp groups most summers. Students come from all parts of Texas to stay in the Malloy Center and spend their days building wheelchair ramps, patching floors and walls, mowing yards, and blessing many people in the Southeast Texas community. For more information about any of the above outreach programs, call the church office at 409-886-7466.